There's always something to be said about a handmade card. My best friend's daughter makes me one every year for my birthday and they're always my favorite. I love that she takes time to make one just for me. But it seems as adults we always just grab one off the shelf (not that there's anything wrong with that - I've gotten some great store-bought cards!) but sometimes it's nice to sit down and make one from scratch. Did you know it's really pretty simple to make your own customizable envelopes and cards from scratch? All you need is another envelope in a size you like (opened and layed flat), a pencil, some scissors, a bone folder (you also could just use a dull butterknife if you don't have one) and some cardstock. 1. Start by tracing your envelope on a peice of cardstock and cutting out 2. Crease all four edges where they meet the middle using a bone folder, and fold over to intensify (you can use the other envelope as a guide for where to crease, if you need) 3. if you want to add a nice print - now's the time! 4. apply glue to sides of the bottom flap, fold up and fold both sides on top and allow to dry before putting your card in. 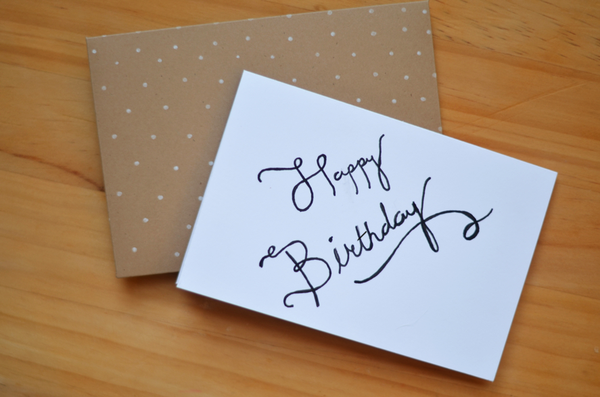 To make a custom card just cut a peice of cardstock to the same width of the envelope and twice the height. Fold over and add some handwriting or use your computer and printer to make a custom graphic.